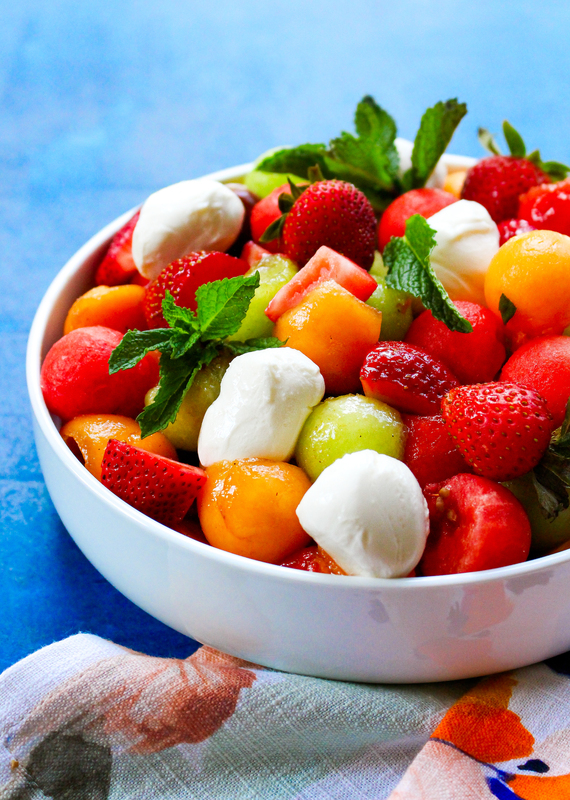 Say hello to the summer side dish of my dreams! Can you believe the Fourth of July is next week? Heck, I can’t even believe today is the last day of JUNE. What?! It felt like April was two seconds ago. Whew. What are your plans for the long weekend? And most importantly, what are you eating?! Burgers, hot dogs, ribs, BBQ chicken??? Potato salad, pasta salad, fruit salad??? Cocktails??? Tell me. We are still in Italy and come home the day before the Fourth. We will probably be super jet lagged but are hoping to take Kieran to our local town’s parade and fireworks in the late afternoon/evening. Given that our fridge will be pretty bare, we will likely have to rough it for the Fourth. Maybe I’ll muster up enough strength to get to the grocery store once we land back in Philly and are settled at home. Given, once I have completely smothered my child in kisses (miss him SO MUCH!) and rub those pups’ bellies until they’re sick of me, I may be too exhausted to run out. We shall see. One thing I KNOW I’ll be craving is this caprese salad. It is summer PERFECTION, guys. 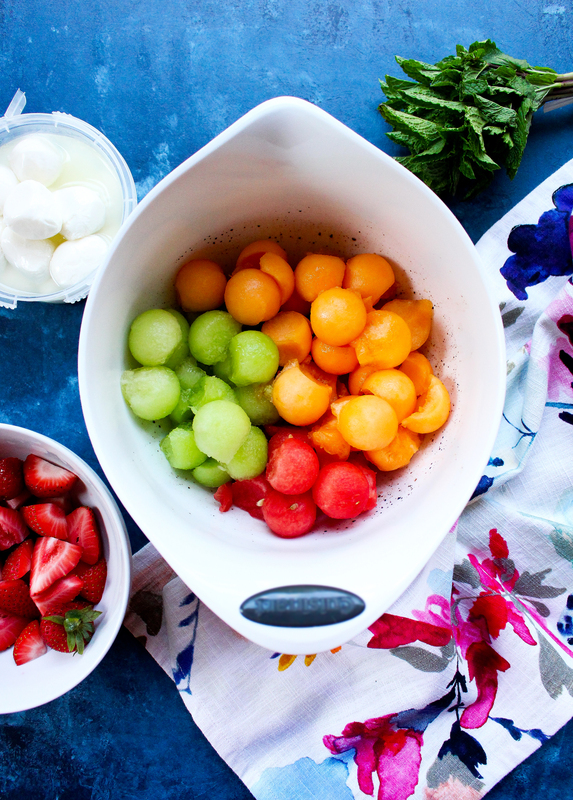 Everything I want in a bowl in the summertime lives here. OK, except maybe the wine. But we can have that on the side! Yes, please. 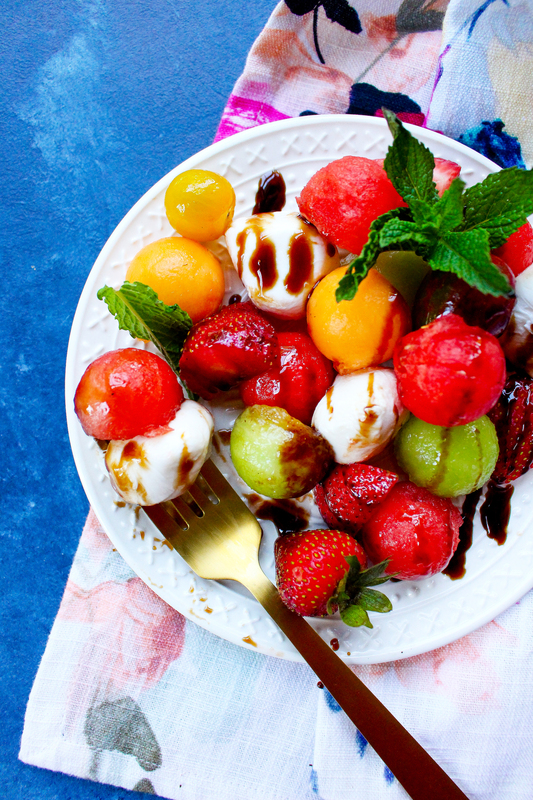 I’ve basically fused two of my favorite things on earth: caprese salad and summer melon. Oh, and I threw in some strawberries for good measure. You all have heard me talk at nauseam about my love for watermelon. I seriously cannot get enough of the stuff in the summertime. I’ll take it any way I can get it, too! In cocktails (here and here), on the grill, and even in salsa for tacos. So, it should not really be a surprise at all that I put it in my caprese salad. Along with some other melon friends for flavor, texture, and color variance. 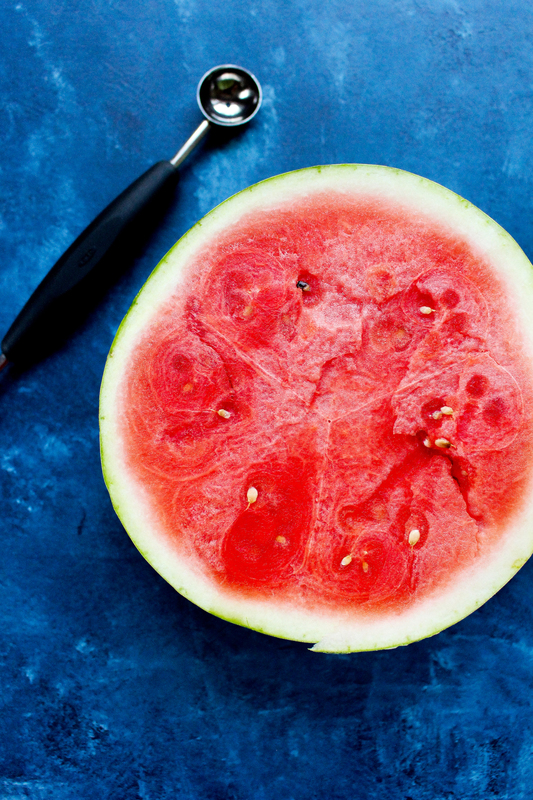 I know many people who have a strong aversion to cantaloupe and honeydew, so if that’s the case for you, feel free to leave it out and sub in with more tomatoes, watermelon, and strawberries. 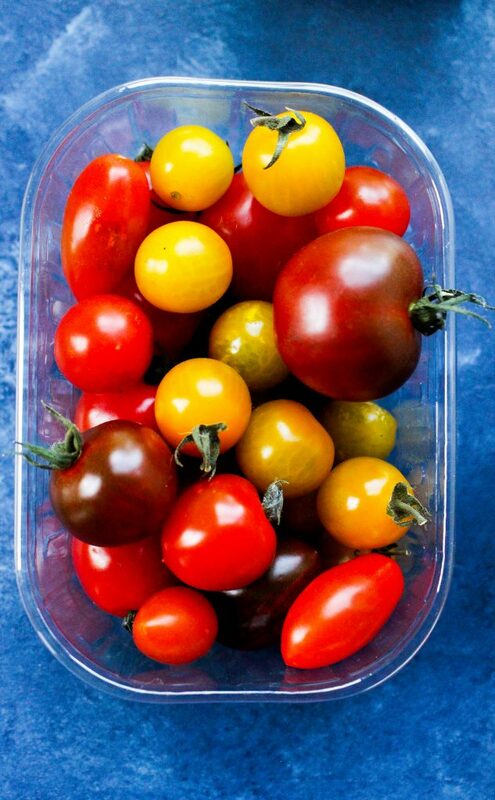 This is a very versatile salad. You do you. But I just have to say: look how pretty those three melons are TOGETHER. I urge you to try it. 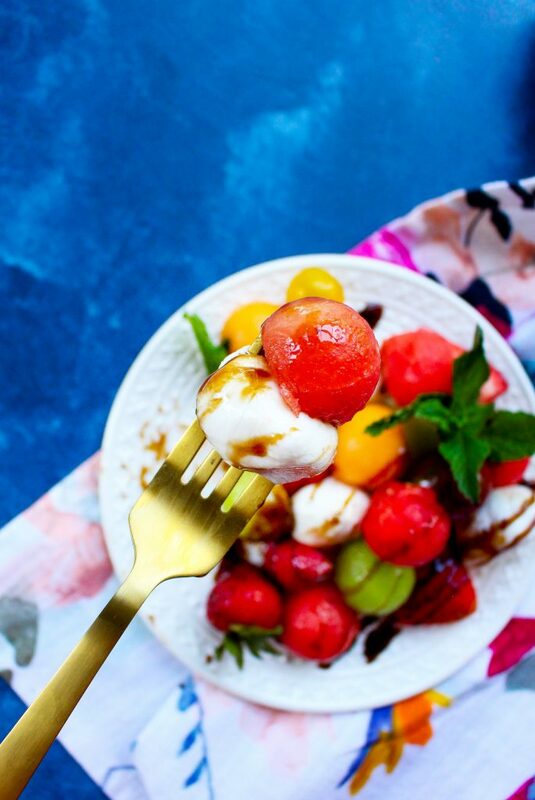 The caprese part of things is pretty standard (because why mess with the best thing? ): heirloom cherry tomatoes, balls of fresh mozzarella, EVOO, balsamic, and some fresh basil. I added some fresh mint into the mix as well because I love mint with any and all fruit, and it was such an awesome addition here. Now, I should mention that my husband, crazy as he is, would not touch this salad with a ten-foot pole. Well, maybe that’s not entirely true. 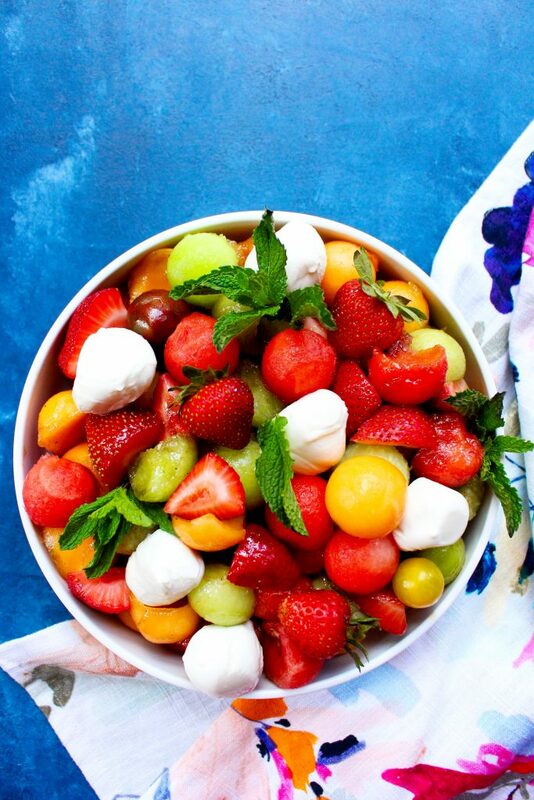 He would come and annoyingly pick out the fresh mozzarella balls and maybe a strawberry or two. But melon is just not his thing. He has zero interest in it, and frankly, doesn’t understand why I love it so much. Remind me, how/why did I marry this guy again? But it does bug me when someone else doesn’t share my love of watermelon! It’s one of the best parts of summer! And I crave it all winter long! 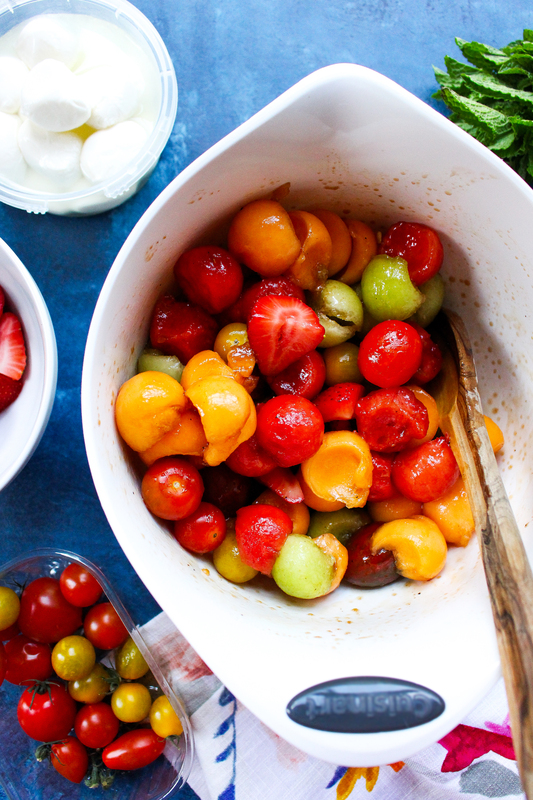 This salad is MEANT TO BE when it comes to BBQs and summer parties. Make it this weekend for your Fourth of July spread! It will be a hit. I mean, we can only eat so many potato and pasta salads, right? In a large serving bowl, whisk together the olive oil and vinegar. Season with a pinch of smoked sea salt and fresh black pepper. 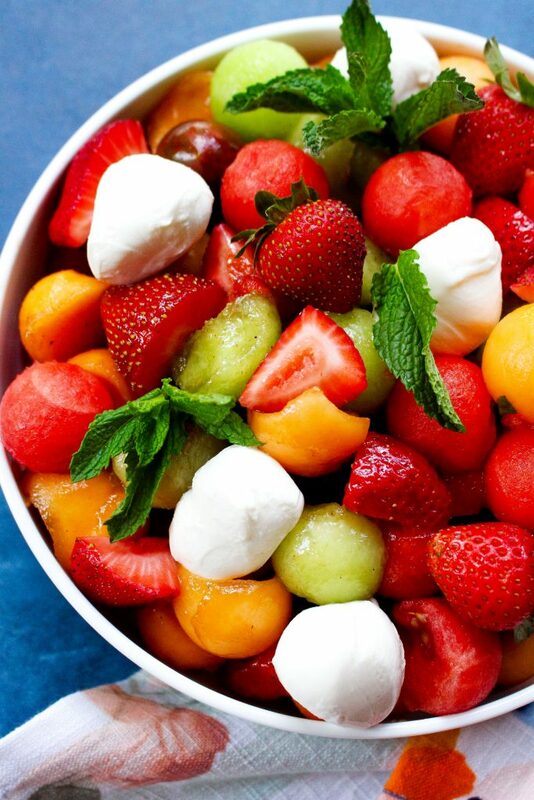 Add in all of the fruit, tomatoes, and mozzarella cheese. Toss well to coat in the dressing. Gently stir in the herbs and season, to taste, with more salt and pepper. 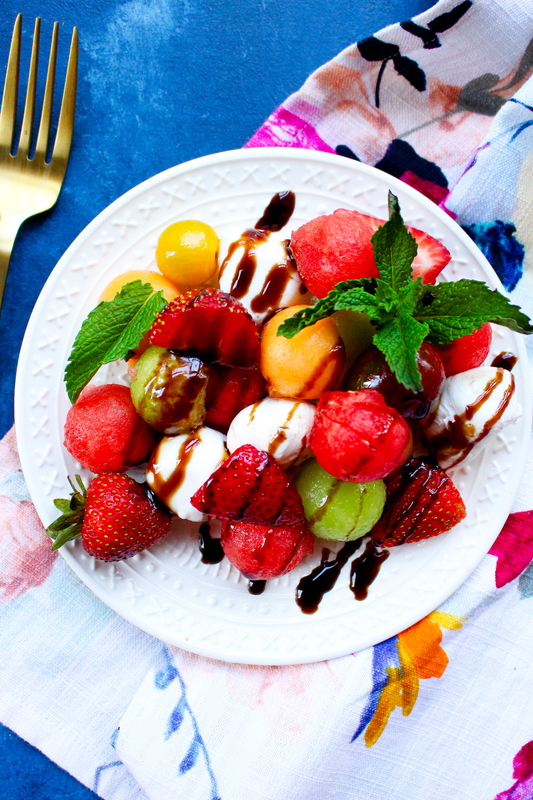 Serve chilled with balsamic glaze drizzled over top.